Last January I made a Giant Chocolate Chip Cookie Cake for no reason, except that I needed something delicious to cheer me up and chase away the winter blues. It’s a massive chocolate chip cookie that’s soft & chewy, made in a 9 inch cake pan, and frosted with chocolate buttercream. Basically my spirit animal dessert. And the perfect easy recipe to brighten up a cold winter day. So I figured it was about time to share another giant cookie recipe: Introducing…. 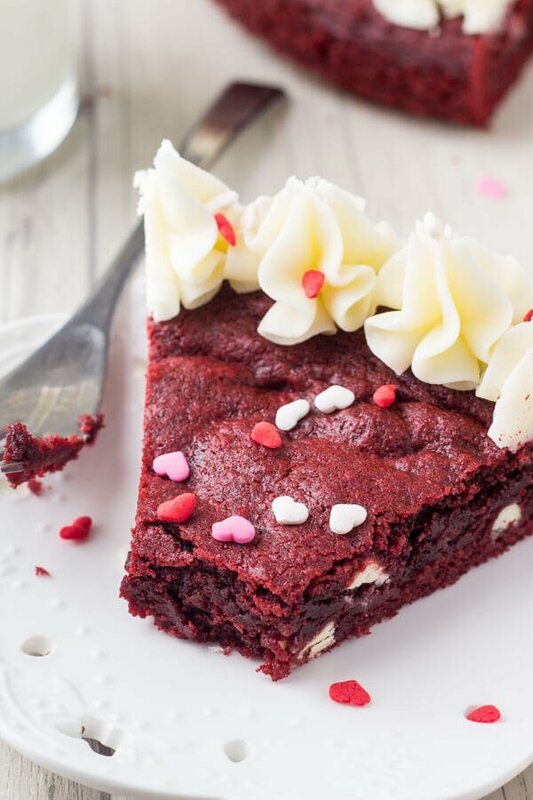 Red Velvet Cookie Cake. All the deliciousness of red velvet, in soft & chewy cookie form, filled with chocolate chips & decorated with cream cheese frosting. It’s made from scratch because I didn’t have the effort to leave the house and buy red velvet cake mix. And seriously, it took me less time to make it from scratch than drive to the grocery store. So win-win! I made my cookie cake as a little pre-Valentine’s dessert, so I added a few heart shaped sprinkles. But it’s also perfect for Christmas celebrations or birthday parties. 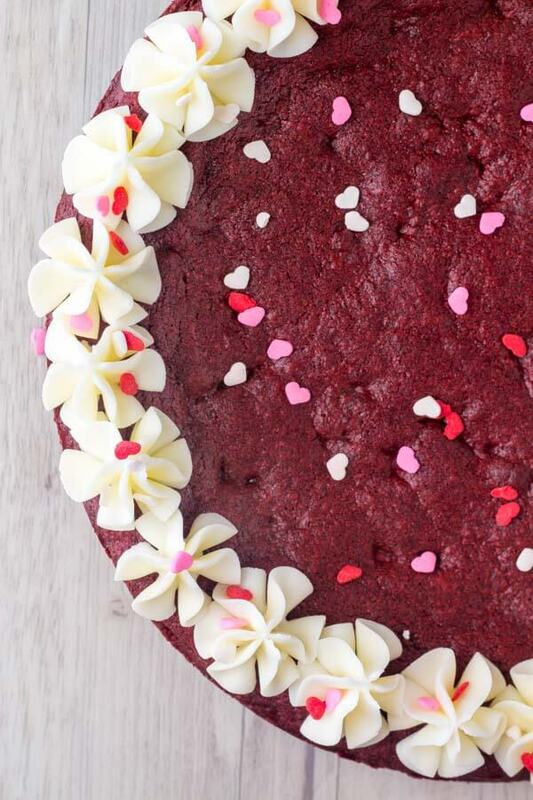 Of course – we’re filling our red velvet cookie with white chocolate chips too. Because the mild chocolate flavor of red velvet and white chocolate is delicious. And if you have the option of chocolate chips or no chocolate chips – I think the choice is pretty clear. After the cake is fully cooled, cream cheese frosting is piped around the edges of our cake for some extra pizzaz. 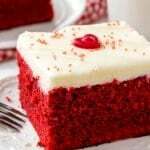 (After all, you can’t have red velvet without cream cheese frosting.) 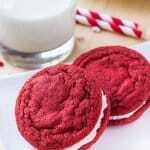 Plus, it makes the red velvet cookie a little extra special. 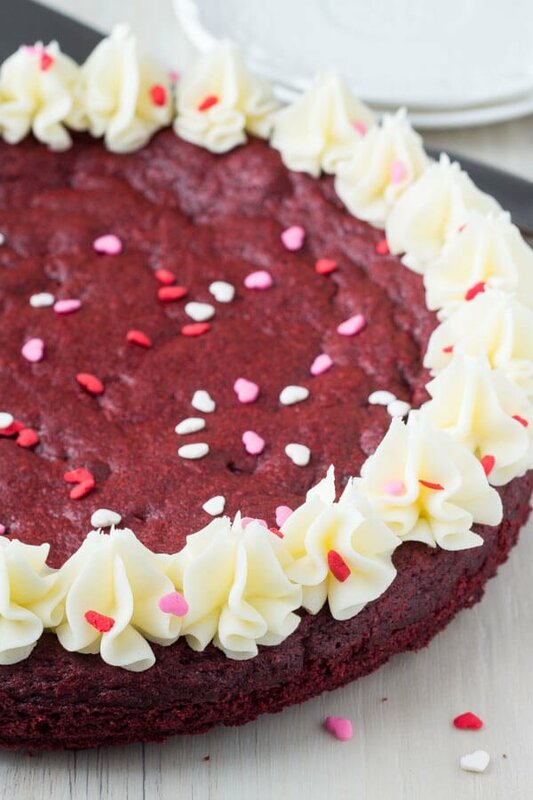 And because a giant red velvet cookie > regular sized red velvet cookie, I definitely recommend this cookie cake for all my cookie lovers out there! 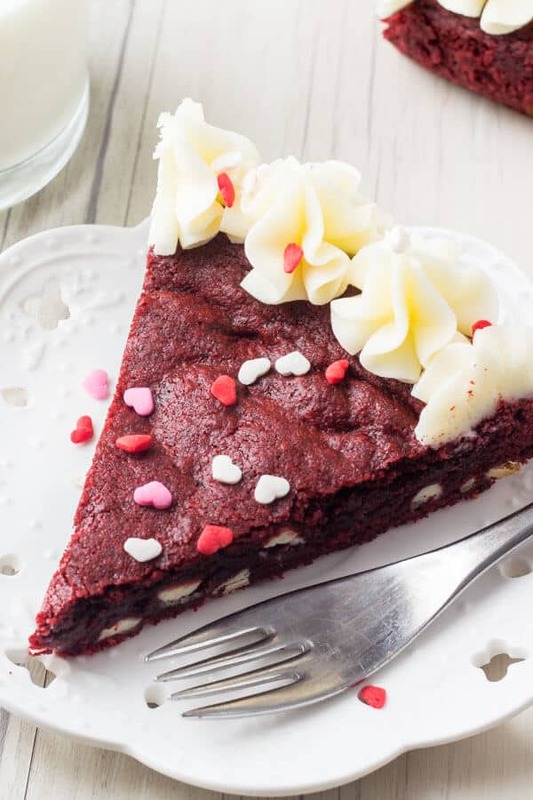 This Red Velvet Cookie Cake starts with a massive soft & chewy red velvet cookie that's baked in a cake pan. Filled with white chocolate chips and decorated with cream cheese frosting - this from scratch cookie cake is super easy & impressive. Preheat the oven to 350F degrees. Line the bottom of a 9 inch cake pan with parchment paper, and grease the edges. I like to use a spring form pan for this recipe. In a large bowl sift together the flour, cocoa, cornstarch, baking soda and salt. Set aside. Then in a separate large bowl using a stand or hand-held electric mixer on medium speed, beat together the butter and sugars until light and fluffy and no sugar lumps remain (about 2 minutes). Then add in the egg, additional egg yolk, vanilla, red food coloring and vinegar and mix until smooth (30 seconds to 1 minute). Turn down the mixer to low speed and carefully beat in the flour mixture about 1/3 at a time. You may need to turn off the mixer and scrape down the sides of the bowl as necessary. Finally, turn off the mixer and stir in the white chocolate chips using a large wooden spoon or rubber spatula. The dough will be very sticky. Spoon the batter into your prepared pan and press it down to the edges. I like to use a piece of parchment paper between the dough and my fingers to stop my fingers from turning red from the food coloring and from my fingers getting too sticky. Bake in the preheated oven for approximately 30 minutes or until the top is set and you can see the edges just starting to pull away from the sides of the pan. In a medium sized bowl using an electric mixer on medium speed, beat together the butter and cream cheese until softened and evenly mixed together (about 2-3 minutes). Then turn down the mixer to low speed and slowly beat in the powdered sugar followed by the salt. Once combined, if the mixture is too thick, add in a little cream or milk, or if it's too thin add in an extra 1/4 cup powdered sugar. 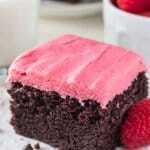 Once the cake is fully cooled, pipe the frosting around the edges. I used a 1M tip for this. * Some readers noted that their ovens took longer to bake. If needed bake up to 40 minutes. I using an 8 inch pan instead of 9 inches, the bake time will be 40-45 minutes. If the top starts to brown too much, tent a piece of aluminium foil overtop for the last 10 minutes of baking. As a big-cookie lover and cream cheese frosting fanatic, this is going on my list of must-make desserts. It looks SO delicious. Totally with you on being a cream cheese frosting fanatic! Let me know what you think of the recipe! This was such an easy recipe to follow and turned out delicious! I did have an issue with the baking time, I checked it after 25 minutes, then 30 minutes then 40 minutes. The center kept coming out soupy (for lack of a better word) therefore the edges were a little more crunchy than preferred but still tasted great! May I substitute green food coloring for St. Patrick’s Day ? Would that work? Thanks! Flavor wise, I think that would be totally fine. I haven’t tried it though, so I’m not sure how much green food coloring you’d need to get a pretty green color. Hey Fiona, I was wondering did you use liquid cornstarch or powder? Hi Fiona, this is to die for! Loved it so much that I featured a modified version of it on my own blog (giving you credit, of course! 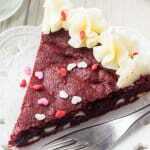 ): http://alovelettertofood.com/recipe/red-velvet-cookie-cake/ Thanks for a great recipe! Made this today. Delish! 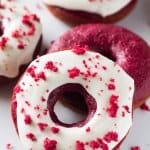 Do you have a recommendation for a cream cheese frosting that pipes well? I tried to pipe rosettes around the border, but this frosting kind of lost its shape and the rosettes sort of turned into blobs. Thanks! I’m so glad that you loved the recipe. I find sometimes if the cream cheese is too warm it’s hard to pipe, so I’ll pop the frosting in the fridge for 30 minutes or so before trying to pipe it. Also, replacing 50% of the butter with shortening because it’s a little sturdier at room temperature.